December 2014 – OK, Fine. A Brooklyn photographer has a video of a New York City Police officer arresting him and claiming that a two-finger ring he was wearing was actually brass knuckles. According to Andre Perry, two undercover officers approached him at Union Station in November, and told him that his ring was considered a deadly weapon. In a post on Facebook, Perry explained that he was handcuffed, and detained overnight. “It made me very upset when I was being held in jail. I was sitting next to people who actually committed crimes. I bought this ring with the intent of wearing it as jewelry. I’ve been wearing it for over a year, and never had a problem, Perry told DNA info in New York. Perry said that he had bought the ring at a Williamsburg flea market. It is marketed by Dallas & Dynasty as a $30 fashion accessory. The photographer, who shot ads for Reebok, Brooklyn Circus and Nordstrom, is now facing charges for two counts of criminal possession of a weapon. According to the Huffington Post, a Michigan police officer was fired after cutting the hair off a detained woman’s head. Also, she will be getting her job back against the wishes of her department. An arbitrator ruled that Warren Police Officer Bernadette Najor be reinstated to the suburban Detroit police force with full back pay, according to the local newspaper The Macomb Daily. The action starts to take place at roughly the 6:15 mark. A man who had posted an online video threatening to kill police and FBI agents supposedly tried to use his car to run down officers seeking to arrest him on Tuesday and, fearing for their lives, they shot and killed him, authorities said. The man was killed in Upper Darby, suburban Philadelphia, as officers ordered him out of the car and he appeared ready to accelerate at them as they manned a blockade. Upper Darby Police Superintendent Michael Chitwood said officers feared 52-year-old Joseph Pacini would kill them Tuesday and that they “did what they had to do.” Together, five officers fired about 20 shots, he said. No officers were injured. The man’s death comes a little more than a week after a man who made similar threats shot two New York Police Department officers dead in their patrol car and then killed himself in a subway station. Pacini posted three online videos with rambling messages and threats after a detective left a message for him regarding an altercation Monday at a fitness club, Chitwood said. If police tried arresting him, Pacini said, there would be “serious and irreversible catastrophic consequences,” including the deaths of law enforcement officers. Police secured an arrest warrant Tuesday. Pacini’s record included a 2005 arrest for locking his Philadelphia landlord in an office while facing eviction and demanding $1,500 at knifepoint to leave, Chitwood said. The charges were later withdrawn, according to court records. Pacini was living with his mother when she had him involuntarily committed, Chitwood said. The date of the commitment was not immediately available. They were still living together in a Clifton Heights apartment at the time of his death. “Certainly in his rant on the Dec. 29 YouTube where he threatened to kill any police, FBI or CIA that came after him, or their families, it was clear that those mental health issues were still affecting his life,” Chitwood said. More than 100 demonstrators gathered Sunday outside FedEx Field in Landover, Maryland, to protest the name of the NFL team and mascot on the final game of the season. While organizers had hoped for a bigger turnout, according to the Washington Post, the protest marked the largest of its kind at a home game. The crowd reportedly formed at a church a short distance from the stadium before marching up a road heavily trafficked by Washington fans going toward the stadium from parking lots. Protesters of all ages, both Native Americans and activists of other ethnicities, held signs and chanted as people walked past. The event was organized by several groups that have spoken out against the use of Native American imagery in sports. Organizations like the National Congress of American Indians, The National Coalition Against Racism in Sports and Media, and Change the Mascot have argued that such mascots dehumanize Native Americans, reducing them to racist stereotypes rather than real people facing real challenges. They say such imagery makes it harder for indigenous people to advocate for themselves, and also has direct effects on the psychological health of Native youth. While most fans walked past the protest in silence, other supporters of the Washington team name were confrontational. Apparently, for years R&B “heart-throb” Johnny Gill has been dogged by rumors of being gay and in a long-term relationship with Hollywood titan Eddie Murphy. Many people know that the two are close and when neither man ever commented on their friendship, the gossip and speculation was put into overdrive. Now, Gill has finally decided to address the rumors about something that is actually nobody’s business to begin with. Gill came in to the show The Breakfast Club on Dec. 12th to promote his new album, Game Changer. Gill, who’s latest album marks 31 years of being in the solo artist game was frank about his friendship with Murphy, to the behind the scenes shenanigans while taking part of the New Edition reunion tour. Gill admits to taking a lie detector test to dispel once and for all if he is in fact gay talk about his relationship with Murphy. A House GOP leader has acknowledged that he once addressed a gathering of white supremacists, though his office denies any association with the group’s social views. 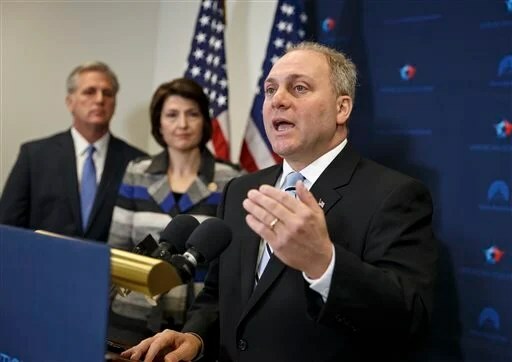 House Majority Whip Steve Scalise, the chamber’s third-ranking Republican, served in the Louisiana Legislature when he appeared in 2002 at a convention of the European-American Unity and Rights Organization (EURO). The group was founded by former Ku Klux Klan leader David Duke, and the Southern Poverty Law Center has classified the group as a hate group. In a written statement, Scalise aide Moira Bagley Smith confirmed that Scalise addressed the group as it gathered at a hotel near the neighborhoods that both Scalise and Duke represented during separate terms as state lawmakers.